Insekt desk is coming next week to Cologne and meanwhile we are having a week with lot of exposure for our products. In Greece, HomeGuide is featuring Insekt desk in their latest blog entry, which has prompt enough reactions from Greek retailers and public through the mail… nice to see Insekt desk and Arré moving on worldwide! Insekt desk +Kids, designed by Buisjes & Beugels Studio has been awarded the Interior Innovation Award 2013 by the German Design Council! This is wonderful news for Kellie Smits, the designer, and for Arré, producer and distributor of Insekt desk range. So for the second time, Arré has presented winning products to the Interior Innovation Award, underscoring the quality of our collection. That’s a good sign! 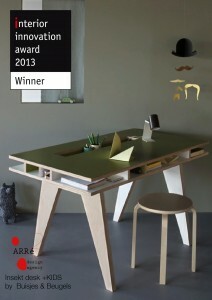 We are shipping an extra insekt desk +kids to IMM Cologne next january, where all the winners of the IIA 2013 will compete for the prestigious “best of the best of 2013” award. An international jury will select and award 15 products in the forenight of IMM Cologne opening. So we are still in the race for more! 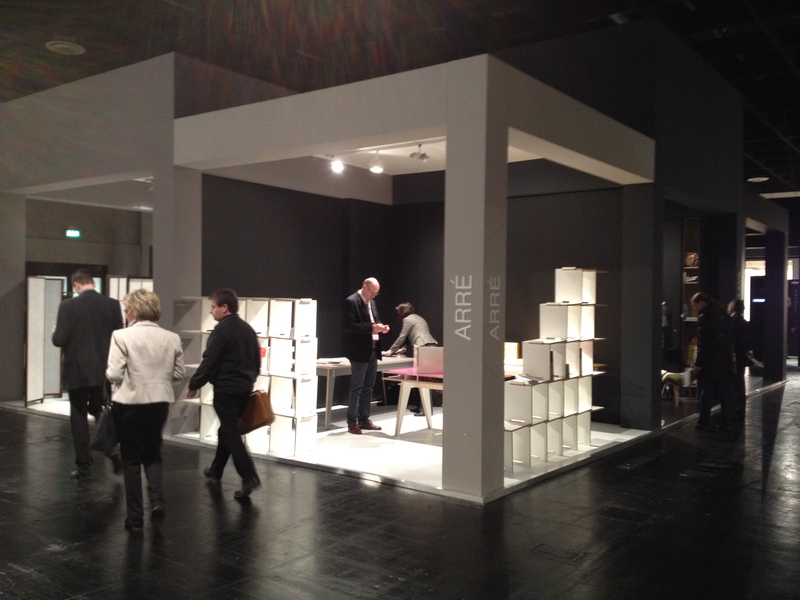 We had a great week at Cologne, where Arré was present for the second time. This time in a professional setting at hall 3.2 in the Pure Village programme. Last year Arré was in the background, supporting Mediodesign at the D3 professionals programme, this time a step forward as a brand. We met lots of interesting people, and we had a great team: Wibo Vermeulen from Amsterdam, Yoraco González from Berlin, Adriana Juncú assisting us with the visitors, and myself. Great show and great products. We got compliments from trade visitors about the L-shelf designed by Juan Pablo Quintero/Mediodesign, which some people already recognised from last year, and about Insekt desk and Ecke Flow table. One of our major highlights, Metro Chairs designed by Azul Cadenas, never made it to the show… one of the minor things that happened. But we got good response to Insekt Desk, people love it. L-shelf still has to break some kind of resistance of the public, but when people see its simplicity and its genius they are crazy about it. Ecke flow had a very good international debut. 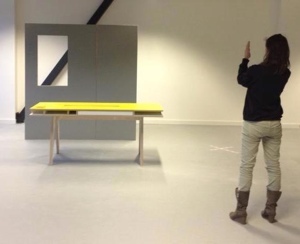 German and France clients were quite enthousiast about the work of Michiel van Malestein from Rotterdam. We are very much in the follow-up now, contacting our leads, and preparing shipment of the orders we took. 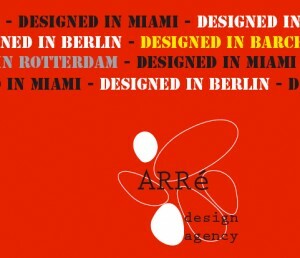 We had a nice booth and a clear message: here is Arré, designed in Rotterdam, designed in Barcelona, designed in Miami, designed in Berlin. The general public was really enthousiast about the L-shelf. During the last weekend of the fair, lot of visitors wanted to know where to buy it. How can we make this information clear to all the interested retailers?? We’ll solve that too. We got some critical remarks from the blogs… surprisingly! 23sqstil was very dissappointed about Arré’s stand. She had followed the company, the work of Yoraco in Berlin, the L-shelf, the new products, etc. She expected more from our show. Well, a critique we take seriously, of course. But for us a kind of recognition that make us smile: we have followers! We have clients. Clients we meet, we meet again, we retake our conversations, we discuss the next trends, the next steps. We are engaged in new proposals, new businesses. We chatted with the press, we explained our work as a new kind og agency to young professionals at the D3… and surprise, some want to be the next one at Arré. A nice show, a great place to meet the world, to show our work. We are still working hard, demanding the best quality in what we do. Follow up time now!!! Arré is ready to show the latest collection of designs and products at IMM Cologne. The show is focused on the international location of our designers and brands, their workplace, their inspiration. Each of them, Juan Pablo Quintero, Kellie Smits, Michiel van Malestein, Azul Cadenas, Yoraco González, are inspired by their cities, interacting with the creative partners, culture, architecture, businesses, friends and life in those places. We like to think that, though it might be irrelevant for some, location plays a part in the creative process. It is the promise of Arré as well, to support those ideas and try to carry the stories and developments that brought them up in the first place. Designed in Barcelona, designed in Berlin, designed in Miami, yes. But what does Arré? Organises in Rotterdam? Management? carries a Collection? Perhaps a new business model, a new mode for design, our way to contemporary furniture, a different approach. We are, most definitely, working on that. We believe that we are preparing to become a furniture and contract label. But we are thinking and pondering, looking around and outside, thinking that perhaps there is room for a more collaborative approach, for effective production, for creating good value with these wonderful resources. We have started engaging conversations with our designers, clients, friends, suppliers, producers, design enthousiasts. In Chicago, Barcelona, Rotterdam, Berlin, Vienna, New York City, Kortrijk. Not only because we like to travel (we do!) but also because this journey of Arré has brought us there. We’ll get there.